Life for Mark Twain (Samuel Clemens) and his new bride in their house at 472 Delaware Street traced an arc rising in romantic bliss, then plummeting into chaotic despair. The thirteen months from February 1870 to March of 1871 that Sam and Olivia spent there seemed evenly split into six months of happiness and six months of misery. Much like a character in a novel by Charles Dickens - a favorite author of Clemens as a teen - the domestic scene at 472 Delaware for the Clemens family represented the "best of time and the worst of times." Mark Twain's house at 472 Delaware was built in 1864 for Henry M. and Elizabeth Kinne. It became the Twain home when Clemens' wealthy father-in-law, Jervis Langdon, conspired with Clemens' bride, Olivia "Livy" Langdon, to purchase and furnish the house as a surprise wedding present for Sam. The couple moved in after their wedding in February 1870. The generous gift allowed the Sam & Livy to live on Buffalo's most prestigious avenue, above the means of a newly-wed newspaper editor at the time. It is said that Clemens hung a plaque on the front door which read: "Mark Twain lives here and my father-in-law pays the rent." Unfortunately, illness and death haunted the Clemens household. Jervis Langdon passed away shortly after the wedding. Olivia's friend visited the couple, fell ill, required extensive nursing, and died in their home. Sam and Olivia's first child, Langdon, was born there, but was sickly and did not survive infancy. The couple sold the house in 1871, never to reside in Buffalo again. It housed several owners until it was badly damaged by a fire on Feb. 8, 1963 and was demolished on July 2, 1963. In 1991, the missing manuscript turned up in a steamer trunk in a Los Angeles home. It was among the possessions of James Fraser Gluck, the lawyer for the Buffalo Library who had requested the manuscript from Twain a century earlier. Twain eventually mailed the missing half of the manuscript, but Gluck, who had apparently taken it home to have it bound, died with it among his belongings in 1897. After gaining possession, the B&ECPL united the manuscript in 1992 for the first time in more than 100 years and showcases this cultural treasure in its Mark Twain Room with a special collection of Huckleberry Finn editions, Twain writings and other memorabilia. 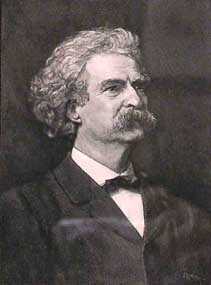 - Reprinted from the Buffalo and Erie County Public Library's "Mark Twain Writing Competition"